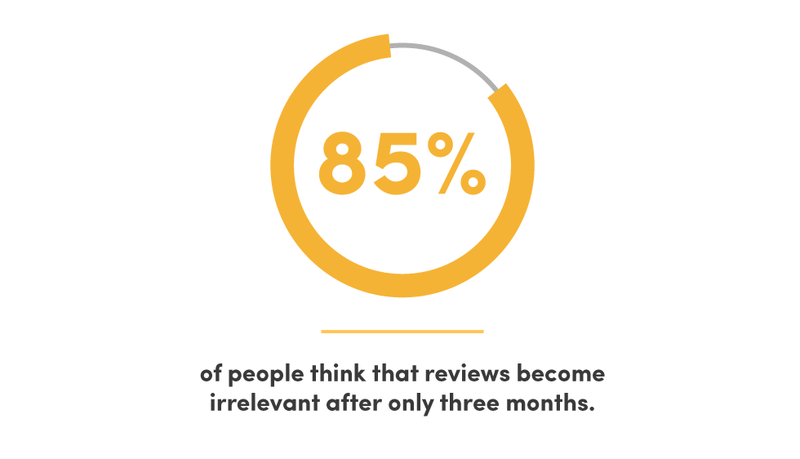 Did you know that 85 percent of people think that reviews become irrelevant after only three months? If you’re sitting there thinking I haven’t gotten many reviews lately, don’t worry! I’m here to teach you several reasons why reviews are so important to local businesses and how we at RevLocal can help. Why Do Local Businesses Need Reviews? Believe it or not, consumers read about 10 reviews before being able to fully trust a local business. This makes getting reviews on a consistent basis key to gaining the trust of potential consumers. The people who read reviews the most are typically in the 18-34 age range. And, hopefully, it’s not surprising that most reviews are viewed on mobile devices. As a local business owner, you sometimes have to cater your digital marketing towards the age range mentioned above. Brand Awareness. People leaving reviews for your local business can actually be a marketing tool in itself. How? Well, once people start leaving good reviews on several different sites, your business's name starts to spread! Your customers are actually doing the marketing for you. Reviews will build your brand awareness and credibility for your business. Improve SEO. Not only will reviews spread your business’s name, but it will also improve your rank within organic search results! When your brand is mentioned more frequently in reviews, it will become more relevant to search engines. And because reviews are posted by individual people, search engines consider them as unique content. Drive Traffic to Your Website. One of your main digital marketing goals for your business is getting people to visit your website, right? If a potential customer is reading online reviews about your business and decides they want to learn more or make a purchase, the next step is for them to visit your website! Good reviews are more likely to drive traffic to your website. I feel like I can’t say it enough — your business needs reviews! Running a local business can make you busy, but generating and responding to reviews shouldn't fall to the wayside. At RevLocal, we have Renown, a review marketing and management platform. With Renown, your dedicated marketing strategist can help your business gain and manage your reviews to keep your reputation in order. With 89 percent of consumers reading the business responses to reviews, who wouldn’t want help managing them? By using Renown, you will build trust with your customers and drive referrals more than you ever have before by getting quality reviews. Reviews aren’t an aspect of your digital marketing that you should overlook, no matter how busy you may be. Review management is an ongoing strategy that our team at RevLocal can help with! Check out this quick video to learn more about Renown, our review marketing platform.